Winter has come to Kherson. It has been very cold for several weeks and there is snow on the ground. One of my favorite sights in Kherson when winter arrives is the appearance of the small runner sleds that people use to transport small children around the city. All it takes is a little bit of snow and out come the sleds. At the kindergarten near my apartment, the sleds are lined up waiting for the small passengers. The children, even very small ones, love to be pulled around in their sleds. I see parents enjoying the fun, too. In the park at the University where I live, parents are running around the football field to give the children a fast ride. And there is one small hill where the older children are using their sleds to speed down the hill. Lots of laughing and no one cares if they fall off. Everyone is wrapped in thick, warm snowsuits so no one gets hurt. Some parts of winter are not as much fun, especially trying to walk around on the icy streets. I have some “Yak Tracks” to put on my boots so I don’t slip on the ice and fall. Last year, these little ice picks attracted a lot of attention and funny looks from Ukrainians as I walked around the city, but this year I see Ukrainians wearing them. There were two people at the bus stop this morning wearing these ice picks, and I have heard that you can buy these at Fabrika now. It is a good idea because falling on the ice is not fun and you can really get hurt. This winter we can all enjoy a special event. This is the year for the international Winter Olympics. The games will take place in Sochi, Russia which is not too far from Kherson. The Games start this weekend, with the opening ceremonies beginning at 18:00 on Friday night. All over the world people will be turning on their televisions to watch the activities and competitions. It is a great honor for Russia to host the Games, and preparations have been underway for years, transforming the city of Sochi to host thousands of international visitors. My home in Massachusetts has cold winters with a lot of snow, so I have enjoyed winter sports all of my life. I have been skiing and ice skating since I was a small child and was a ski racer in high school. My daughter, nieces, and nephews are all ski racers. All three of my brothers played ice hockey. We all love to cross-country ski and so we really enjoy watching the Winter Olympics. My husband and I will be watching many events over the next few weeks. It is especially nice to be living very near to the Olympic games. The time difference to the United States means that you must watch events in the middle of the night or you will already know who won the race before it is shown on television. Here in Kherson we will be able to see the events while they are happening. We also like it that we cannot understand a lot of what the announcers say, so we just watch the event and enjoy it. In the United States the announcers talk all the time and tell you a lot of unnecessary information about the athletes. More information then you really need, so it is fun to simply watch these world-class athletes compete. I hope there is something about winter that you like and that you are enjoying this beautiful season. It will be fun to see the result of the Olympic Games and then we can welcome Spring to Kherson. At English Club on December, 15, 2013, we talked about the winter holidays here in Ukraine and in the United States. I can make one observation immediately about these holidays. Children in Ukraine and children in the United States are all very excited about these coming holidays. Many other holidays throughout the year are fun for children and adults, but no other holidays are anticipated and dreamed about as much as these holidays. Whether it is Santa Claus, Kris Kringle, Saint Nicolas, or Дед Мороз that the children are waiting for, they are all bursting with excitment. At English Club especially the younger children, who still see these holidays as a magic time with their families and Дед Мороз, could not sit still for one minute because they were so excited. Every topic we discussed, from family traditions, decorating the tree, singing carols, to waiting for their presents to arrive only made them more and more excited. It was a lot of fun to work with them and share their enjoyment of the season, and it was lovely that they went home with their parents. We did have a lot of fun comparing the holidays. In the west, we celebrate Christmas on December 25th and then New Years one week later. These are the major holidays. Christmas is a religious holiday for Christians, with the celebration of the birth of Jesus Christ as the reason for the holiday. Most Christians attend church on Christmas Eve or Christmas Day for a service that is filled with light and singing. Then Christmas Day is a family holiday with gifts and special food. New Years Eve is the final celebration and this is more of an adult event with parties and celebrations with friends. There is champagne at midnight, singing the old Scottish song Auld Lang Syne, and telling the resolutions that you have made for the new year. It is also traditional for grandparents to stay home with the children on New Years Eve and have a celebration with the children. New Years Day is a quieter family day, often the day to take down the Christmas Tree, watch American football on television, and pack away the decorations for next year. And, of course, a special meal. And then the holidays are over for another year. Schools have been closed for about 10 days and will open again on the first weekday after New Years. While the dates are different in our two countries and the order of the holidays a little different, the traditions are really very similar. Most Ukrainian holidays have been unfamiliar to me, and even the ones that are the same, like Easter, are celebrated quite differently. But the music and singing, decorations, presents, Christmas Trees, food and time spent with family are very similar in both countries. Families in both countries celebrate the winter holidays with their own variations of the cultural traditions, and all children look forward to these holidays each year. This is a time of year that is a challenge for parents all over the world. We all want our children to enjoy the excitment of the season, while also making sure that they take time to eat and sleep and do their school work. It is a difficult balance and the smallest thing can send them from joy to tears. For all of us, the memories are about the warm feeling of being a family and the joy of seeing the holiday through your children’s shining eyes. So to you and your family, I wish all the joys of this beautiful season. As we say in America; have a Merry Christmas and a Happy New Year! Wednesday, November 20, 2013, the International Day of the Child, was a very special day for me. I was invited, along with my Counterpart Anya, to visit School #39 for an Open English Lesson. 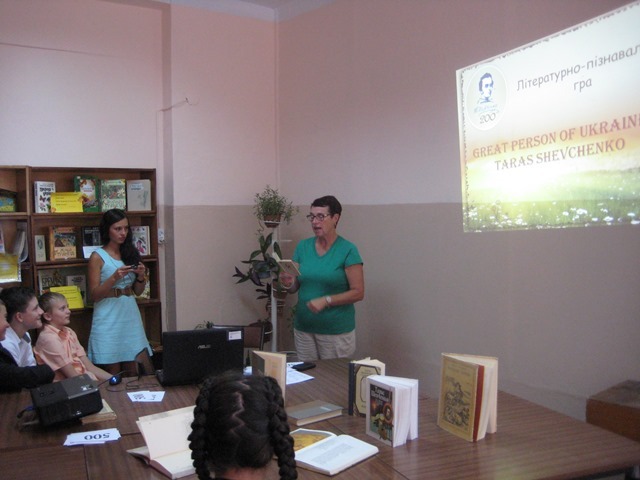 Marenchyk Olga, the Director of the School and an English Teacher asked us to part pate in her lesson. This is a wonderful school that I have visited before. It is located just outside of Kherson and is a school with bright, happy children who seem to be very comfortable together. They are all interested in their lessons and seem to enjoy learning and being together in their warm, friendly school. The theme of this lesson was the relationship between children and their parents. This is certainly an international topic, one that children and parents all over the world can relate to. I could not help think about my own daughter and the pleasures and challenges of raising her and watching her become an adult. School # 39 invited the parents of the students to participate in the lesson. Some of the parents also attended this school and were taught by Marenchyk Olga, making the event even more enjoyable. For a very pleasant class period, the children and their parents shared their feeling and emotions about their relationships, the atmosphere in their homes, and the inevitable conflicts that can arise. What parent has not struggled with the request of a child to stay out late, go off with friends, or have a boyfriend or a girlfriend. As a parent myself, I can say that the child always seems too young to the parent. And, of course, the child always feels that he is “grown up” enough to make his own decisions. This day was completely enjoyable. The children did a wonderful job with their English, the parents told them how much they support them and how proud they are of them and everyone had a wonderful day. I enjoyed meeting everyone and was pleased to share my own family with them. This will be a warm memory of Ukraine for me. The close relationship of families is one of the real strengths of your country. It is a privilege to share an event like this with you. Autumn and the beginning of school always feels like a new beginning in America, sometimes even more than the traditional New Year of January 1st. Children return to school, one year older and in a new class. Older children go off to college and university. The relaxing summer is over for families and everyone gets back to the busier schedule of work and school. The weather and the leaves on the trees begin to change also, and we put away our summer clothes and starting wearing warmer winter clothes. It is the season of the harvest and everyone is enjoying the last fruits and vegetables from their gardens and from local Farm Stands. In the country, there are many fairs and festivals where everyone displays the best items from the garden and prizes are awarded for the biggest and best vegetables, and for the best chicken, rabbits, goats, sheep and cows. Look at this website http://www.belchertownfair.com/fair/photos-2012/ to see some pictures of the Belchertown Fair in the small town where I live. The whole community volunteers to make the fair possible and everyone has fun visiting with friends and neighbors. In the cities, there are Farmer’s Markets everywhere, so these city-dwellers can enjoy the fresh vegetables and produce, too. When large displays of pumpkins appear at the Farm Stands and Markets, everyone knows that it is really Autumn. People from the city take a trip to the country to buy some pumpkins and do something outdoors while the weather is still nice. A popular activity is to visit a Corn Maze. Farmers’s plow complicated designs into their corn fields. They look beautiful from the air and strange from the ground. Visitors try to find their way through the maze without getting lost, take pony rides, shoot the potato cannon, and try other fun activities. Mike’s Maze is near my home in America and is a lot of fun to visit. Take a look at the maze for this year and all of the past years at http://mikesmaze.com/. There are also some pictures of the farm and the other activities that Mike offers at his farm. Everyone wants to be outdoors enjoying the beautiful weather before winter arrives. Now that I have been in Ukraine for 20 months and seen all of the seasons, I know that many of the same things happen in Ukraine. The Bazaar is full of wonderful fruit and vegetables. Families are preserving the produce from their dachas and going to the forest to gather mushrooms to save for the winter. Everyone is enjoying the warm, sunny days because it will soon be winter. Autumn is a wonderful season, no matter where you live so be sure to get outside and have fun while the weather is still fine. Sunday, September 1, 2013, was one of my favorite days in Ukraine. The Celebration of “First Bell” is a very nice way to start the school year, with children and their parents participating in celebrations in the schools and then spending the day together in the parks and cafes. In Kherson, there is a new place to celebrate First Bell, Fabrica. We do not have this holiday in America because school calendars are not controlled by the federal government. So individual school systems (usually a city or a town) decide the day that school will start. 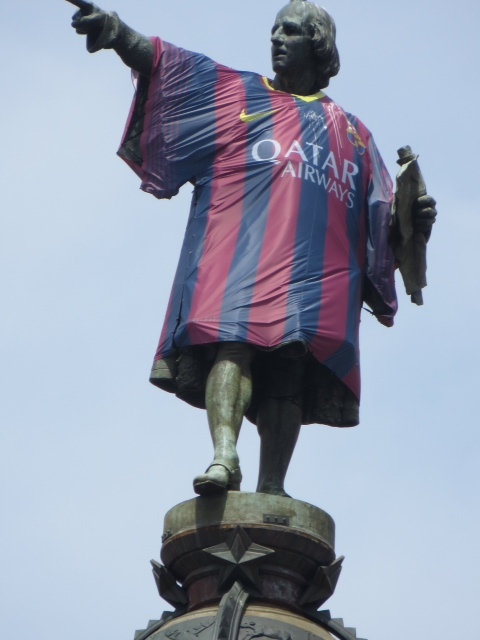 This decision is made for different reasons. For example, schools in the South often start in the middle of August, but schools in the North do not start until September. There is a national holiday in early September called Labor Day. It is the holiday that celebrates the efforts of the working man and woman, and it is always the first Monday in September. For Americans this is the last “summer” holiday and some schools open after Labor Day to allow family vacations to continue until Labor Day weekend. the American Councils, and gives secondary school children from Eastern European countries with an opportunity to study in the United States for one year. This is a competitive program and interested students should visit the website at http://flex.americancouncils.org/ for more information. The Lyceum currently has a student studying in America through Flex. The teachers at this Lyceum are doing a good job getting the information about Flex to their students. So the school year has begun and the students and teachers are happy to be back in the classroom. We are ready to visit the schools, have our English Clubs, and encourage the students to take advantage of the resources of the Window on America room. Our room is being renovated right now to give us a better space to work together. Watch for information on the progress of the renovation and then visit us in our new space. Independence Day, or 4th of July, is a very special holiday in the United States. It is the birthday of America. This year America is 237 years old. 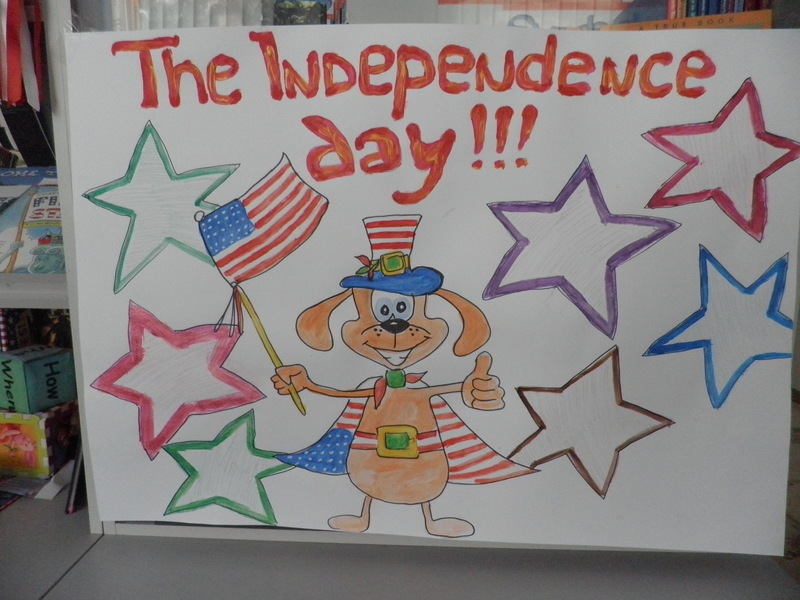 The children who come to the Window on America Center at our library are always interested in American holidays, so we planned an activity to show them how this holiday is celebrated in America. We also talked about Independence Day (August 24th) in Ukraine. When we asked the children how they celebrated Independence Day in Ukraine, they said that they listened to a concert, heard speeches, had picnics and went swimming. In America, on 4th of July, there are parades with a lot of music, speeches about freedom and the history of America, picnics and swimming. The most common celebration of 4th of July in America is to have a fireworks display. Most cities and towns in America have a fireworks show in the evening of 4th of July. We watched some videos about Independence Day in America. The best one was a video produced by a 5th grade class in America. They answered questions about the 4th of July with their voices and their drawings. It was interesting and funny. Then our children wrote good wishes for America’s birthday on the stars on a large poster. 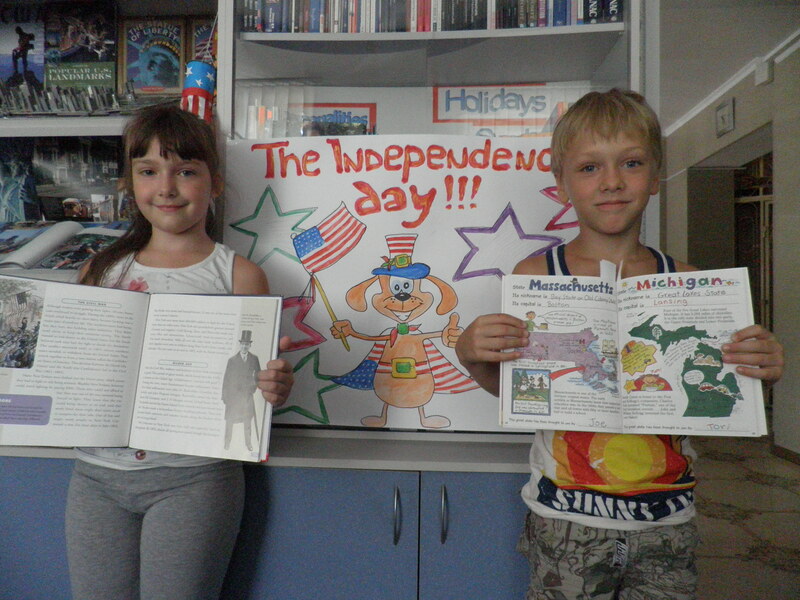 The event gave the children information about American 4th of July and an opportunity to think about the meaning of Ukrainian independence as well. Here I am enjoying my second summer in Kherson. I came to Kherson last year on June 1, 2012. Everything seemed very strange to me at this time last year. Even taking the Marchutka to work was an adventure. Was I taking the correct bus? Would I recognize my bus stop? Could I remember how to walk to the library? And then there was the adventure of shopping in the Bazaar. Now all of this seems routine to me, and I can sit on the bus and think about my day or the movie I saw last night and still find the bus stop and the library. My first year in Kherson passed very quickly. Last summmer was very hot, the autumn weather was a relief, the winter was cold and icy, and it was wonderful to watch everything come alive again in the spring. My husband and I have made wonderful friends, enjoyed our work, learned a lot about Ukraine, and adjusted to the things that are different from our lives in America. We are excited about the work we will do during our second year, now that we understand our living situation so much better. Here at the library, we have had a whole school year of English Clubs, covering many interesting topics. About 90 children of all ages, and levels of speaking English, participate in the Clubs on Sunday morning. I visited many of the elementary and secondary schools in the city with my wonderful colleagues from the Window on America room. We did an English lesson with the children, and encouraged them to visit the library and attend the English Club. Many of our Club participants came from these visits. We always tell the kids about the resources that are available through Window on America. I learned that very young children who speak some English usually have a parent who speaks English and works with the child to encourage this language development. For other children, during the 5th Form it seems to be the year that they really begin to understand and speak the language. Many older children speak English (and sometimes German) quite well. In fact, one of the surprises for my husband and I in Kherson is that there are many residents of the city who can speak some English. This has helped us many times when we were lost or confused. Personally this has been a year of very interesting travel for myself and my husband, and sometimes our daughter Molly. We have now visited Chernigiv, Kiev, Odessa, Simferopol, Sevastopol, Yalta, Bakhchysarai, and Stary Krym in Ukraine and we plan to visit Donets’k and Lviv during our next year. We have been to Odessa and Kiev several times and have learned our way around. Two weeks ago, in Kiev, we even went swimming at Gydropark and saw the famous weight lifting area. 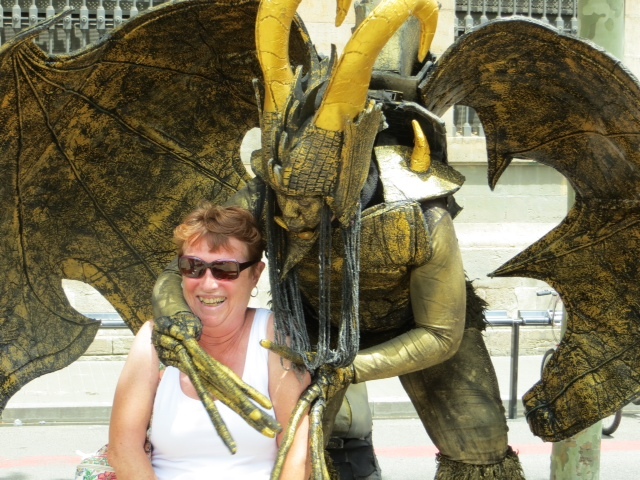 We have also been fortunate to travel abroad to Istanbul, Paris, Barcelona, and the Costa del Sol. Every place we have visited, both in Ukraine and abroad has been a great adventure. It is a wonderful benefit of being a Peace Corps volunteer and we now realize how fortunate we are to have a United States passport. I will be at the library during the summer, usually on Monday and Wednesdays, if you would like to stop in and chat. And in September, we will begin another season of English Clubs and visits to schools. Enjoy your summer, have a rest, visit the sea and I will look forward to seeing you. Today it feels a little like Spring. It is only early February but already the days are growing longer. The short winter days are the same at my home in Massachusetts in the United States, and I should be used to this. But every year while we are enjoying the other seasons, I forget about the short, cold winter days. I am looking forward to my first Kherson spring. I have been busy with work and travel recently. My daughter, Molly visited from the USA in December. Molly is 24 years old and works as an accountant in Washington, DC. She had a wonderful time during her visit, meeting our friends and colleagues. 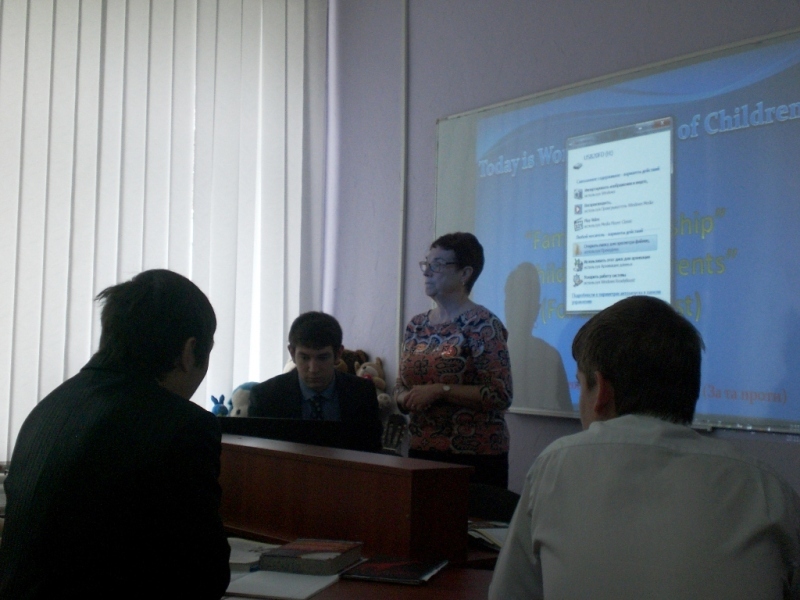 She visited the Window on America room, and also made presentations to my husband’s students at Kherson National Technical University. It was very cold while Molly was visiting, but we dressed warmly and walked all over the city. We even attended a “Disco Night” with the students from the University. It was held at “Chocolate” and we had fun dancing the night away. With my family, I traveled to Istanbul for our Christmas Day on December 25th. It is a beautiful city with friendly local people, excellent food, and many beautiful sites to visit. We really enjoyed our adventures there, visiting both the European and Asian areas of the city. The city is built on seven hills with several waterways separating sections of the city. You can take ferry boats back and forth and visit beautiful palaces and churches that have been there for hundreds of years. My favorite site was an underground reservoir called the Basilica Cistern. It was the water supply for the city hundreds of years ago, and is under many of the historic sites in the city. If you would like to see it, watch “From Russia with Love”, a 50-year-old James Bond movie. You can see the cistern and practice your English while you watch. Last week, I traveled to Kiev and Chernihiv to attend Peace Corps training. It is always fun to visit Kiev. There is so much to see and do. We visited the National Art Museum, the Chernobyl Museum, St. Micheal’s Golden Dome Monastery and Saint Sophia’s Cathedral. In Chernihiv, my husband and I visited the host family that we lived with when we came to Ukraine last year. It was wonderful to see them again and to hear each other’s news. The grandson, Sergey, has grown four meters and learned a lot more English since we left. So many journeys and visits with friends and family. Over the next few weeks we will celebrate St. Valentine’s Day and Saint Patrick’s Day at our English Club. Be sure to come and celebrate with us. We are waiting for you. On Sunday, December 9, 2012, Lindsey Diloreto visited our English Club, giving our children another chance to meet and speak with an American. Lindsey is a Peace Corps Volunteer from the state of Pennsylvania. 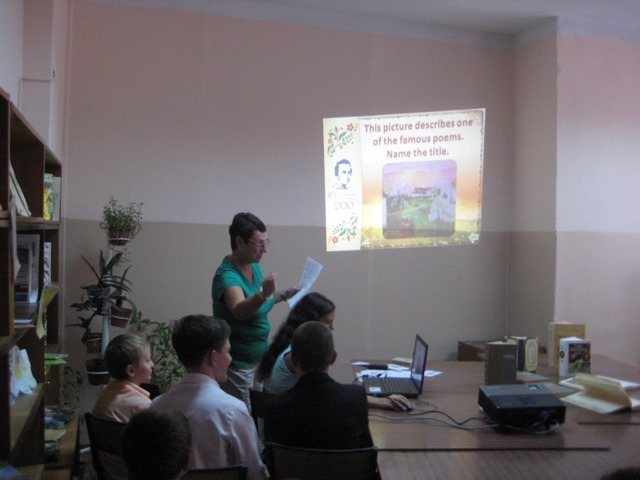 She lives in a small village near Kherson and wanted to meet the children who come to the English Club. Lindsey is 23 years old, works with the children in her village, and is learning to play the guitar. Perhaps she will come again and sing some songs for us. The topic of the Club this week was “Traveling in English Speaking Countries.” We talked about the five largest countries where English is the primary language. These are the United States, Great Britain, Canada, Australia, and New Zealand. We had fun “planning” our imaginary trips to these countries and talking about the tourist attractions we would like to visit. Some of the popular choices were New York City, London, the Sydney Opera House, Niagara Falls, the site of the Lord of the Rings movie, Big Ben and Hollywood. There were 63 children at the Club meetings this week. The next English Club will be on December 23, 2012 and we will be talking about Christmas in America. It is always celebrated on December 25th. It is a religious holiday, celebrating the birth of the Christ Child with many traditions. So we will talk about Christmas trees, Santa Claus, and decorations. Come and join us. I also had a meeting with the parents of our English Club children this week, which I liked very much. I see many of you every week, and it was nice to speak with you. We talked about the challenges of being a parent, and about education in Ukraine and America. I really appreciated your attention and your questions. And I love getting to work with your wonderful children. On December 19, 2012, we will have a special visitor at the library. 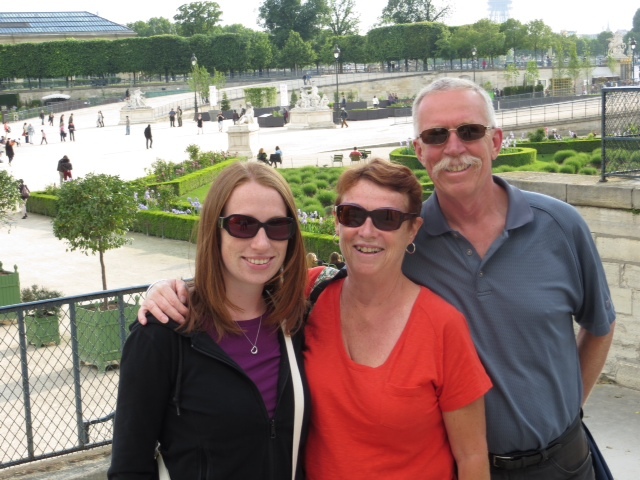 My daughter, Molly McCafferty, will be visiting from American. She would like to meet you and talk with you about her life in America. She is 24 years old, lives in Washington, DC, and works as an Accountant. She will be in the Windows on America room from about 13:30 to 15:00, so come visit if you would like to meet her. 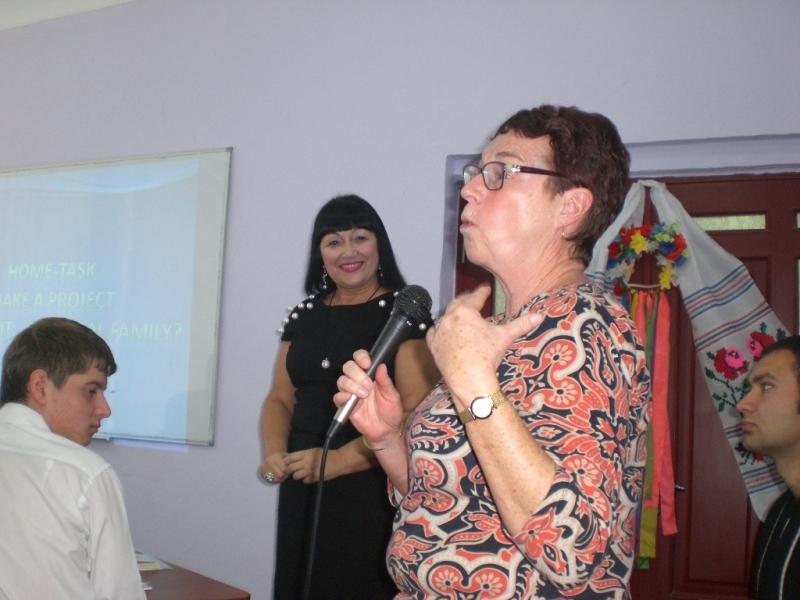 She will spend a week in Kherson and would love to hear about your life in Ukraine. My life in Kherson is getting very busy so the time is going by quickly. I have been here for 6 months, have met more than 600 school children, and many wonderful adults. My husband and I are feeling at home here, and really enjoying our time with you. I look forward to having many more wonderful experiences with you in 2013.